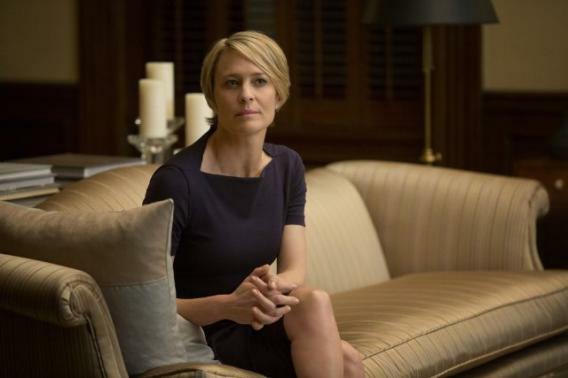 One of the things that grabbed me most about the new Netflix House of Cards—other than the fact that I watched all 13 episodes in a 24-hour span—was the superb performance by Robin Wright. As Rep. Francis Underwood’s intensely focused wife, Claire, Wright managed to convey ruthlessness and driving ambition while also suggesting that Claire was questioning some of her life choices, especially when it came to love and romance. But since Claire is the sort of woman who is slow to trust and share, Wright had to express this inner turmoil in a guarded, coded way. There’s a transactional quality to many of Claire’s relationships—much of her social life revolves around stage-managed appearances alongside her politician husband or fundraisers for the nonprofit she runs. And so she doesn’t open up with many people. Still, it’s striking how utterly reluctant she is to acknowledge the hot flashes she appears to experience early in the show. A female friend who notices her lingering for longer than is strictly necessary in front of the refrigerator tries to start a conversation about hot flashes and night sweats, but Claire simply changes the subject. Later, Francis brings up the same refrigerator pause, in what seems to be an attempt to shake Claire’s steely composure. Perhaps Claire’s hot flashes were simply a way to signal that the character is going through changes, of a piece with the other things she does in the first two or three episodes in the series: fire half the staff of her nonprofit, rekindle an old affair, and take up origami. Or perhaps it was one of the series’ surprisingly subtle references to Macbeth: Those hot flashes conjuring up Lady M’s plea that the spirits “unsex me here,” just as the screaming lady Claire runs into on a jog through a cemetery stands in for the witches on the heath, and just as the images of sinks, baths, and running water remind the viewer of Lady Macbeth’s “Will these hands ne’er be clean” soliloquy. Claire’s refusal to discuss her medical situation isn’t surprising, exactly—given society’s attitude to older women, even a rich, successful pillar of the community might prefer to divert attention from conversational topics that indirectly reveal her age. But watching those scenes, it struck me how rare they are on television: female TV characters almost never go through menopause. This seems strange, since it’s something that happens to every woman. In the world of comedy, menopause is a more common plot device—because what could be funnier than men being grossed-out by the middle-aged female body (That ’70s Show), or freaking out that middle-aged women are losing their minds (All in the Family), or watching women deny their age and head to Menopause Anonymous (Absolutely Fabulous)? The best comedies can also mock Menopause Panic. In the scene from The Cosby Show below, Clair Huxtable (Phylicia Rashad) teases her well-meaning family by play-acting all the terrible symptoms that menopausal women are believed to suffer through. Then she not-so-gently reminds them all not to be so idiotic.